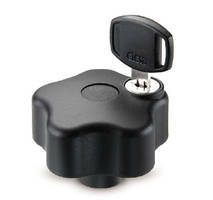 Five Lobed Plastic Knobs feature lockable design. Available in metric sizes, EN 5337.9 Technopolymer Plastic Lockable Safety Five Lobed Knobs with tapped brass insert are temperature-resistant to 215Â°F, as well as resistant to solvents, oils, grease, and other chemical agents. 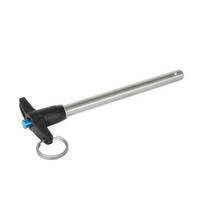 To engage and release, key must be inserted and turned by 180Â°, creating formlock between handle and tapped insert. Turning key back by 180Â° will release connection. Key can be inserted and pulled off in both end positions, and 2 keys per knob are included. Technopolymer Plastic Lockable Safety Five Lobed Knobs Available from J.W. Winco, Inc.
NEW BERLIN, WI – J.W. Winco, Inc., a leading supplier of standard industrial machine components, announced it now offers EN 5337.9 Technopolymer Plastic Lockable Safety Five Lobed Knobs, With Tapped Brass Insert, in metric sizes. 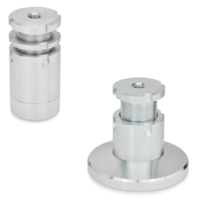 These RoHS-compliant safety five lobed knobs are temperature resistant to 100°C (215°F), as well as resistant to solvents, oils, grease and other chemical agents. To engage and release, the key must be inserted and turned by 180°, creating a formlock between the handle and the tapped insert. Turning the key back by 180° will release the connection. 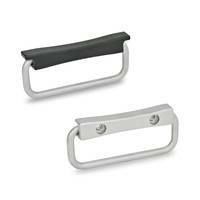 The key can be inserted and pulled off in both end positions, and two keys per knob are included. 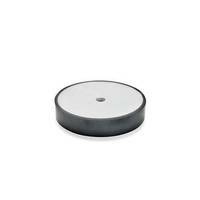 The hand knob is made from a special glass-fiber reinforced technopolymer plastic featuring a black matte finish, with the underside plastic cover ultrasonically welded to the handle body. The tapped insert is brass, molded-in, with a zinc die cast lock mechanism, while the key is brass and nickel plated, with a plastic grip. J.W. 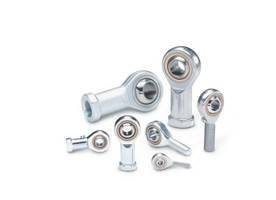 Winco offers an extensive selection of inch and metric size adjustable levers, cabinet U-handles, plastic and steel hinges and locking mechanisms, revolving and retractable handles, hand wheels, hand cranks, tube connection and conveyor components, inch and metric construction tubing, shock absorption mounts, leveling mounts, hand knobs, spring, ball and indexing plungers, jig, fixture and fastening components, retaining magnet assemblies, toggle clamps, metric casters and wheels, universal joints, oil sight glasses, and metric tools for the industrial and commercial equipment industries. J.W. Winco’s website catalog, with 3D CAD and online buying, is viewable at www.jwwinco.com. For more information, contact J.W. Winco at 800-877-8351, by fax at 800-472-0670, on the Web at www.jwwinco.com, and via e-mail at sales@jwwinco.com. Illuminated Knobs make indicator characters visible. Plastic Clamping Knobs have snap-in, star-shaped design. 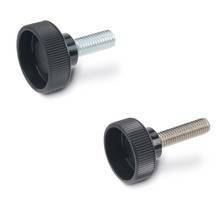 Plastic Hollow Knurled Knobs have stainless steel threaded stud. Hollow Knurled Knobs feature non-marring threaded stud tips.